The complete genome sequences of our closest existing and extinct relatives are now readily available. This has not only made possible the identification of positions in the genome where we are similar to chimpanzees and other apes but also reveals where and how all present-day humans, no matter where they live on the planet, are identical to each other but different from Neandertals. Since the genetic differences between these species are those that set modern humans apart from all other organisms on the planet, the identification of these unique positions constitutes an essentially complete “genetic recipe” for being a modern human. A major challenge for the next decade is to identify which of these genetic changes had important consequences, in particular with respect to the cognitive and social abilities that have made the development of rapidly changing technology, large societies, art, and perhaps modern language possible. Understanding the meaning of these differences is a crucial undertaking to fully explain the human condition and to address the diseases and other conditions that affect traits that are unique to humans. The development of the process of generating induced pluripotent stem cells from somatic cells, which can then be differentiated into any cell or tissue type, allows investigators to establish cellular and organ-specific systems to identify functionally important genetic differences occurring through primate evolution. The further establishment of specific gene-editing tools increases the precision through with these studies can reveal important changes. 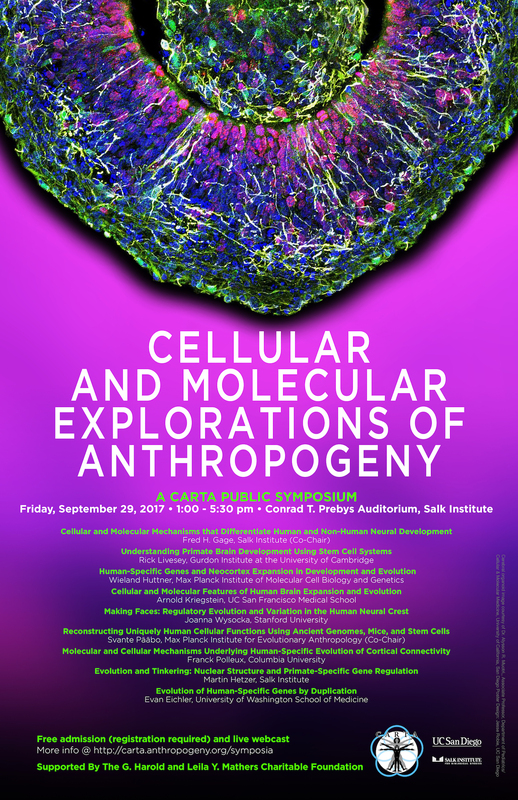 This symposium will be the first of its kind to explore the progress being made in this new area of Cellular and Molecular Anthropogeny.